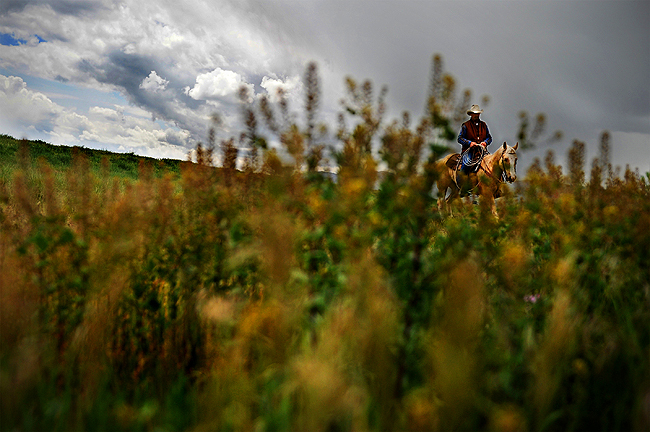 "With dark clouds approaching from the west and a light drizzle falling, John Mecham, of Spanish Fork, circles around on his horse, Tipover, as they ride alongside 8000 South in Spanish Fork on Monday afternoon. Rain rolled into the valley on Monday night. The forecast is calling for rain and possibly thunderstorms Tuesday and Wednesday with high temperatures in the 40s and 50s. Sun and gradually rising temperatures will make their way into Utah by the weekend." Last week, I got a call to find a feature on my way back from the south. Rain was supposed to make its way into the valley, so we needed something weather related, although it wasn't storming yet. I drove around for a bit before I passed this cowboy riding his horse on the side of the road. I passed him and shot a couple frames out of the window. I thought it wasn't anything spectacular, but I quickly changed my mind and pulled a U-turn. I hopped out of my car and introduced myself. I instantly felt hostility. I loved it. I've been seeking hostility since moving to Utah. There isn't any out here or so I have yet to find. Despite his rash remarks and blunt personality, which I am used to on the east coast, I got a couple minutes to work the scene as he trained, rode his horse named Tipover. Before I knew it, he was riding away in the distance, probably cussing me. I was happy I had something for the day and happy to have gotten his information to go along with it. The best part though was getting an e-mail from an editor of a small community paper in Spanish Fork that we own. She thought it was down right amazing that I got Mecham's name and information, not to mention picture, as she knows exactly how he is and acts. I got a laugh out of the e-mail. I just hope to run into some more stories, folk, even Mecham again, down in Spanish Fork as I am totally intrigued by their culture and way of life. Yeah, I know John too. Maybe in his old age he's mellowed; but not that long ago he'd just as soon punch you out as give you the time of day. Great photo!